In recent months, articles on “drones,” properly termed as unmanned aircraft, are popping up in the media everywhere as a “revolutionary” new tool for producers, agronomists, seed distributors and others to use in their daily operations. The stereotypical view of unmanned aircraft systems as weapons of war in foreign theaters is rapidly evolving into a new image of these systems as civilian tools for facilitating everything from improving yield estimation to locating lost hikers. However, many in the agricultural community are still skeptical of the true utility of these aircraft in routine operations – and perhaps rightfully so. One difficulty in explaining the utility of unmanned aircraft is that they can range from the size of a baseball to a commercial airliner. However, small unmanned aircraft are proving to be the most versatile systems for agriculture because of their relatively low cost, ease of operation, and the fact that they do not normally require a runway. Current university research at Kansas State University is focused on using aircraft that weigh less than 55 pounds for agricultural remote sensing, with most of the aircraft weighing less than 15 pounds. Aircraft this small are certainly limited in the amount of imaging equipment they can carry, but today’s modern cameras are producing amazing imagery in very small form factors. So what exactly are these tiny unmanned aircraft actually able to do? 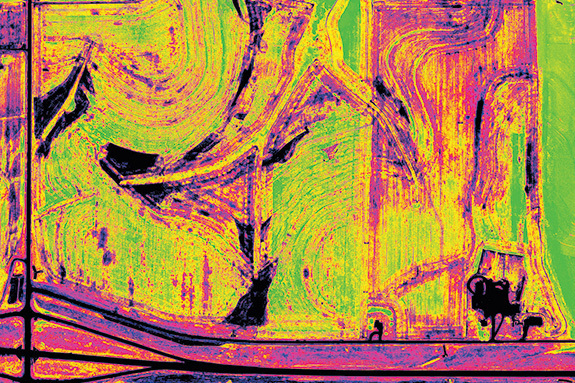 The bulk of the research in agricultural applications of unmanned aircraft is based around providing high-resolution, multispectral aerial imagery. In plain terms, unmanned aircraft carry special cameras that can sense different types of light, including “near-infrared.” These images are extremely clear, sometimes even clear enough to see individual plant leaves. By assessing the amount of near-infrared and visible light that reflects from the leaves of the plant, the normalized difference vegetation index can then be calculated, which provides an indication of the relative health of the plant. Essentially, agricultural unmanned aircraft are able to survey a field and collect data which can determine the relative health of the plants throughout the field with great precision. However, there are still some pieces missing to make this information useful to the average grower. Unfortunately, unmanned aircraft cannot provide information directly to the grower that tells what might be wrong with areas that show signs of plant stress. Determining the cause of plant stress still requires someone to investigate suspicious areas, identify the issue and then recommend a corrective action. 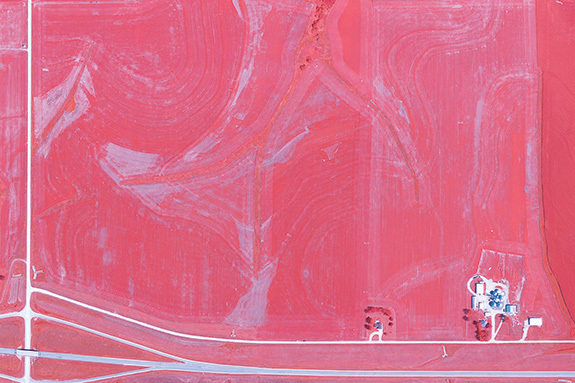 However, once the cause of plant stress is known, the imagery from the unmanned aircraft can be used to look at larger areas and other fields that may show the same characteristics to determine the extent of the damage. Researchers at numerous universities are currently working on developing a “catalog” of plant stress conditions as viewed through remotely sensed low-altitude imagery, which should allow for a rough prognosis to be performed off of the imagery alone, but boots on the ground will still be required for quite a while to verify results of the normalized difference vegetation index analysis. Unmanned aircraft can certainly provide growers with a rapid aerial view of their land with enough detail to identify major trouble areas. However, developing detailed crop reports, chemical application plans and yield estimates typically take the expertise of an agronomist along with corroborating reports from traditional crop-scouting techniques. Despite the tremendous good that unmanned aircraft can bring to agriculture, there are several key issues holding this technology back: maturity of the aircraft and data, federal restrictions on their operation and privacy concerns of the public. The majority of small unmanned aircraft on the market are too costly, have issues with reliability and are not designed for agricultural applications. Many current systems can cost in excess of $40,000; however, there are trends moving toward designing very low-cost, simple systems that can provide the data and reliability needed for agriculture at a price point well below $10,000. Additionally, the processing of aerial imagery is gradually being streamlined with new software coming to the market, and it will be only a short while before quality data can be provided to the grower with just a few mouse clicks. Another major hurdle still to be overcome with unmanned aircraft systems is that the Federal Aviation Administration (FAA) does not allow commercial use of the aircraft. Therefore, unmanned aircraft have been restricted to hobby aircraft modelers and “public” use such as the military and public research universities. Many believe that the FAA considers farmers flying their own aircraft over their own land classifies as “recreational” activity; however, there is no doubt that the FAA does not permit crop consultants or others to provide unmanned aircraft services to a grower, as this is a “commercial” enterprise. This can be seen from numerous “cease and desist” letters that the FAA has sent to a variety of commercial businesses operating unmanned aircraft. However, the FAA Modernization and Reform Act of 2012 mandates that the FAA must integrate unmanned aircraft into civil airspace by September 2015, which means that legal commercial operations may not be far away. Unmanned aircraft may become an extremely useful tool in the future for numerous stakeholders in the agricultural industry. However, they are currently limited in the results they can provide and legal commercial operations are still a few years away. Regardless, the interest from the agricultural community is pushing the technology forward at an ever-increasing rate, and pressure on the FAA may result in unmanned aircraft being routinely used on farm fields sooner than expected. 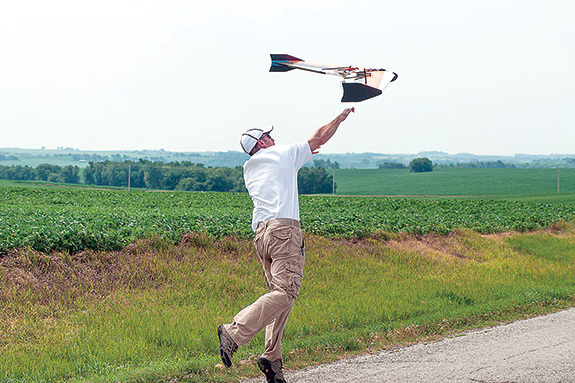 TOP IMAGE: Matt Balderree, a senior enrolled in the Kansas State Unmanned Aircraft Systems program, launches the Zephyr unmanned aircraft over a soybean field. BOTTOM TWO IMAGES: Infrared mapping is one of the advantages of unmanned aircraft technology. Aerial images can indicate areas of inadequate plant health due to water, soil or nutrient stress. The FAA is mandated to integrate the technology by 2015. Photos courtesy of Mark Blanks.